Michael Long displays his car after winning Sunday's Demolition Derby in Clarence Center. It’s always great to see someone go out on top. 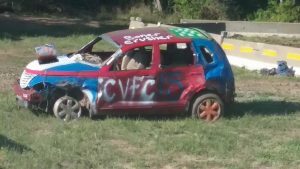 Such was the case after last weekend’s Demolition Derby, a featured event at the annual Labor Day Fair. The weekend tradition raises money for the Clarence Center Volunteer Fire Company’s Benevolent Association. Thus another chapter of an odd motor sports tradition in Clarence goes into the books. The demo derby, as it is usually called, is a curious part of the sports scene. In a world in which cars usually go out of their way to avoid crashes on and off the track, the drivers in such competitions seek them out. The origins of the demo derby are cloudy – appropriate for an event that often sends mud and dust into the air during its staging. There are claims that the derbies began in the 1930s, with a field of decaying Model T’s knocking each other around in a last gasp before the junk pile. Another source has the first official event taking place in California in 1947. But clearly, the first track to be associated with the demo derby is in Islip, Long Island. The first such crash-fest took place there in 1957. By the 1960s, demo derbies received a huge boost when ABC’s Wide World of Sports took an annual visit to telecast a competition. ABC also showed figure-8 racing from Islip, which also had its share of collisions but didn’t have contact as the point of the exercise. The derbies were a fixture of the sports anthology show well into the Seventies, perhaps because the ratings were so good. One 1974 estimate put the viewership at 25 million. Honest. The rules are rather simple. The old cars – which have had the glass removed before the race for safety reasons – rumble into some sort of open area usually filled with dirt. They collide with each other until there’s one car left running and moving. Hits are not allowed on the driver’s door. If a fire breaks out, the action comes to a halt while firemen charge out with extinguishers. Each car has a stick on the driver’s side. If the car is incapacitated, the driver breaks off the stick to indicate he is out of the race. The action usually comes with a certain degree of disappointment and frustration. 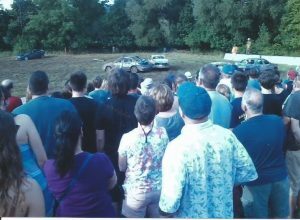 Viewers who watched the ABC program – a group that no doubt consisted of a large percentage of adolescent boys – learned some valuable lessons about the art of driving in a demo derby. They still hold true today. The biggest is that you need to drive backwards for the most part. That way, a car can back into an opponent in order to try to leave it disabled and thus out of the competition while doing as little damage as possible to your own car. That principle still holds. “Yes – you save the engine until the end,” Long said. The Demo Derby always packs them in at the Labor Day fair. Long re-added his name to the list of winners of the annual event in Clarence Center – or, he would have done so had there been such a list. The Fire Company’s website reports that the Labor Day fair dates back to 1922, and it has been held each year since then with short breaks for World War II and in the late 1960s. However, there’s no sign of an on-line history of the demolition derby at the annual holiday festival. A guess would be that it dates back to the Sixties or early Seventies. A big crowd always turns out for the derbies, which are held on Saturday and Sunday of the holiday weekend. Some sit in some bleachers that are up a small hill that provides a better look at the action. Others want to be closer to the collisions, so they surge forward to the first row of the potential viewing spots. On Sunday, Long hopped into a car to represent Crittenden’s company one last time. When the green flag fell, Long used the knowledge of a cagey veteran to stay outside of the majority of the action and pick his spots. There’s no use taking unnecessary hits in a derby. “You don’t want to go crazy out there,” he said. Finally, after 20 minutes or so, Long was driving the last car to be moving. There’s a small bit of glory involved in the win, at least in terms of bragging rights with the other volunteer firemen. But this year, there was no dramatic scene of the victor clutching some hardware as the fans roared their approval. At least he woke up the next morning with the thrill of victory to go along with the aches and pains that Long said come with participating in a demolition derby. “It’s silly, and at the end of the day it’s just a bunch of volunteer firemen – brothers and sisters – having fun,” he said. No more demo derbies for this vehicle.